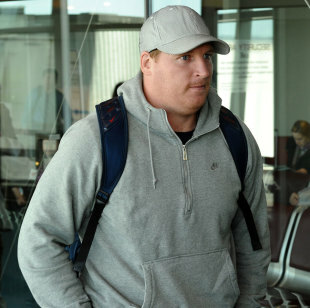 England boss Martin Johnson has confirmed that Thomas Waldrom has joined the World Cup squad as the official replacement for injured prop Andrew Sheridan. The Leicester No.8 linked up with the squad in Auckland today, having initially been called out to New Zealand last week as injury cover for Nick Easter. Sheridan suffered his tournament-ending shoulder injury in England's opening Pool B victory over Argentina a fortnight ago but Johnson decided against calling for an immediate replacement. The England medics have been assessing Easter's bad back, which ruled him out of the Georgia and Romania games, and Matt Stevens' ankle problem. But Johnson has today decided to stick with four props in his 30-man squad and strengthen England's back row options with the inclusion of Waldrom. "Nick is making good progress as is Matt Stevens but with Thomas now out here it makes sense to get him into the squad officially so he can join in with training," said Johnson. "We also owe it to Leicester to make a decision so that they can plan accordingly without him." Waldrom was a member of England's initial 45-man World Cup training squad but he was hampered by a calf injury and was cut before the August warm-up internationals. The 28-year-old had played in Leicester's first three Aviva Premiership games before being called out to his native New Zealand as cover last week. Waldrom was born in Lower Hutt, near Wellington, and only discovered in March that he qualified for England courtesy of his grandmother. England's decision is a blow to Leicester, who signed him from the Crusaders last year on the understanding they would not lose him to international duty. The Tigers, beaten by 50-25 by Saracens yesterday, have now lost 12 players to the World Cup and are short of England flanker Tom Croft plus injured loose-forwards with Craig Newby and Jordan Crane.